Twenty two years in the army and two and a half years in the Cabinet Office has given me a long track record in various aspects of crisis response and management. Indeed, the last time I had sat across a table from Michael Portillo who also took part in this programme was at a late night meeting trying to grapple with a real life military crisis in the Balkans in the mid 1990s. He was the secretary of state and I was a staff officer running the aptly named Yugoslav Crisis Cell. Michael Portillo and the other members of the panel including very senior former policemen and emergency service officials had impressive credentials. But we were all a little nervous as we gathered in a studio on the South Bank to make the programme. Given the times we live in, we knew that the most likely and most difficult scenario facing us would be a complex Islamist terrorist attack on London. And so it was as events unfolded. The emergency began with three separate suicide bombs on the tube in central London and climaxed with the suicide detonation of a chlorine tanker in the City of London. In many ways the programme was extremely realistic. We were under time pressure - the simulated news bulletins which were the main driver for our activity came thick and fast and the news got worse as the afternoon wore on. But there were two big differences from dealing with a crisis in the real world. First of all we did not have the satisfaction of actually having all the official levers of response at our finger tips. For instance we agonised for some time about whether we could get hold of military helicopters to evacuate casualties. In reality this would be simple. 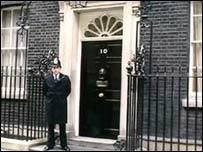 In the face of a massive attack of this sort the government's central crisis response machinery, COBRA would go into immediate session in an underground room beneath Whitehall, most probably chaired by the prime minister himself, as it was on 12 September 2001. If that meeting was anything to go by - I was there but sitting in the cheap seats at the back - decisions will be taken calmly and with despatch. Because it was the prime minister making the decisions the process was remarkably simple and re-assuring. In the scenario in this programme, should helicopters be required, the prime minister would simply ask the senior military officer in COBRA to get as many as possible as soon as possible to Hyde Park or wherever the designated landing spot was. This may be improvisation but improvisation is bound to be part of any crisis reaction plan. Second, the scenario we played out assumed that we received little or no warning of what was to come. This may prove to be the case in the real world but we would have to be very unlucky for that to happen. Even if the available intelligence was patchy it might be enough for the police to increase security on the underground - which might deter even suicide attacks. In the case of a chlorine tanker hijacked, driven into the City of London and then detonated - my guess is that it would be intercepted and destroyed, if necessary, long before it threatened the financial heart of the country. But still, I was struck by the lack of preparedness in some areas. I found it disturbing to hear that so long after 9/11 the Fire Service are still waiting for new search and rescue equipment. It is astonishing that emergency service radios are ineffective underground and almost beyond belief that London Underground staff have yet to receive training to deal with terror attacks. Overall, I found it a fascinating and demanding exercise. I hope it provokes discussion. The scenario could hardly be called "alarmist" - the type of attacks we reacted to are well within the operational capability of al-Qaeda type terrorists and there do still appear to be gaps in our emergency response system. Nevertheless, all should not be doom and gloom - there is a good chance in my view that we can so order our security affairs to make such an attack very difficult to carry out. In any case as we used to say in the military "train hard, fight easy".